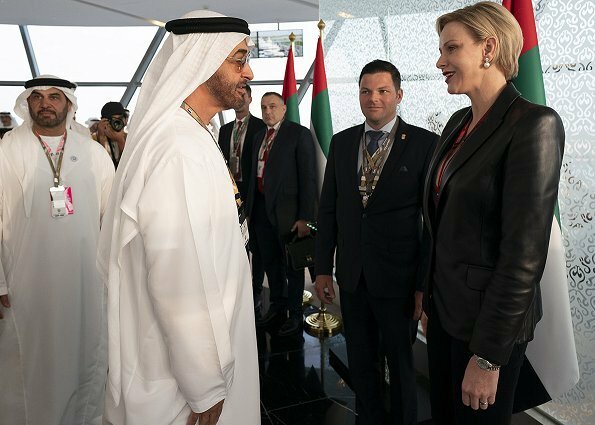 Princess Charlene of Monaco visited Abu Dhabi to watch and support racing driver Charles Leclerc competing in Formula-1 Abu Dhabi Grand Prix 2018. The visit takes place between the dates of November 24 - 25. Charles Leclerc is a Monegasque Formula One World driver who currently races for Alfa Romeo-Sauber F1 team. Elle sourit aussi à Monaco, par exemple lors de la remise des colis ou, le 19 novembre, sur le balcon mais sur certaines photos de la fête nationale, personne ne sourit. Great look on Charlene, very sharp. Look at that smile at picture 2, wow! Agree, a very engaging smile, beautiful. Encourager les pratiques du sport est très bien... mais en dehors du domaine sportif, je me demande si cette Altesse Serenissime a d autres intérêts culturels ??? Charlene is a real athlete , she always looks happy with sports. Charlene's jacket and trousers look sharp and fit well. On other impressions of these photos, no comment. What is the big issue here? Writing "no comment" makes people more curious than saying whatever thing you're actually thinking. Charlene is beautiful and represents Monaco very well. Nice to see Pss Charlene again . Nice black and white combination. Nice to see her smiling, ah yes it is about sport.... Pic5 is funny but not for that short man. en zo leuk aan gekleed ,en dat zeg ik meer ,,alles staat haar!! !